The A2091 is a full-length Zorro-II DMA SCSI hard drive controller that was originally introduced with the A2000HD. Because of the A2091's high availability, it is often found in A4000s, even though it performs slowly in them. The hard drive power connector on the board is not a reliable way to power a card-mounted hard drive. Use the connectors attached directly to the power supply instead. Usually looked on as a cheap (sometimes very cheap) way to access SCSI peripherals from the A4000, the A2091 is certainly better than no SCSI controller at all. A little-known and mostly-unused function of the A2091 is a built-in XT-IDE controller. The IDE connector and LED are not installed, but visible on the board to the left and upper-right of the SCSI chip. Unfortunately, this port will only work with 8-bit (XT) IDE hard drives, not the common 16-bit AT-IDE hard drives. This option was apparently mostly used for the 20M drives supplied with the A590, the A500 hard disk option which shared the 2091 design. 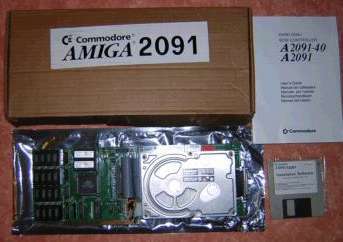 A third party ROM known as the Guru ROM was also produced for this card which provided better performance, bug fixes and support for modern SCSI devices. 0K: Set for no memory. 512K: Set for 512K of RAM. 1M: Set for 1M of RAM. 2M: Set for 2M of RAM. AUTO: Set to enable autobooting from the A2091. DIS: Set to disable autobooting from the A2091. Unit Numbers numbers at each physical SCSI address. Option 3: Reserved. Factory default: Off.